Say I have a cubic Bezier curve, with a starting point s, an ending point e and control points c1 and c2. Given t between 0-1, I want to find the equation of the subsection of the curve between 0 and t.
Is this possible without being too computationally expensive? Yes, it's possible. The deCasteljau algorithm divides a Bezier curve into two. If you search, you'll find lots of references. Let me change your notation: let the points of the curve be $A$, $B$, $C$, $D$. So, $A$ is the start point (where $t=0$), $D$ is the end-point (where $t=1$), and $B$ and $C$ are the control points adjacent to $A$ and $D$ respectively. 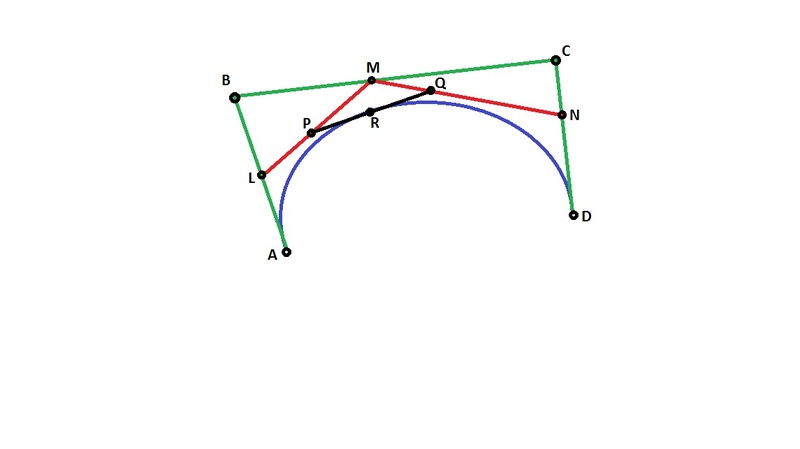 Then the control points of the "left" portion of the Bezier curve (the piece from $0$ to $t$) are $A$, $L$, $P$, $R$. And, if you're interested, the control points of the "right" portion of the Bezier curve (the piece from $t$ to $1$) are $R$, $Q$, $N$, $D$. Approximate arc length of cubic bezier curve? Are there any cubic bezier curve that cannot imitate by multiple quadratic bezier curve?